The preoccupation with the meander has proved that there is basically only one single “true” meander which is suitable for the construction of a labyrinth. Since it depends on the right twist. The number of the lines does not play the decisive role. I have tried to make a classification and would like to propose it here. Though one could speak of a simple meander, or a double or triple and so on. Because here, however, the production of a labyrinth is in the foreground, I find it better to orientate on the number of lines in a meander. 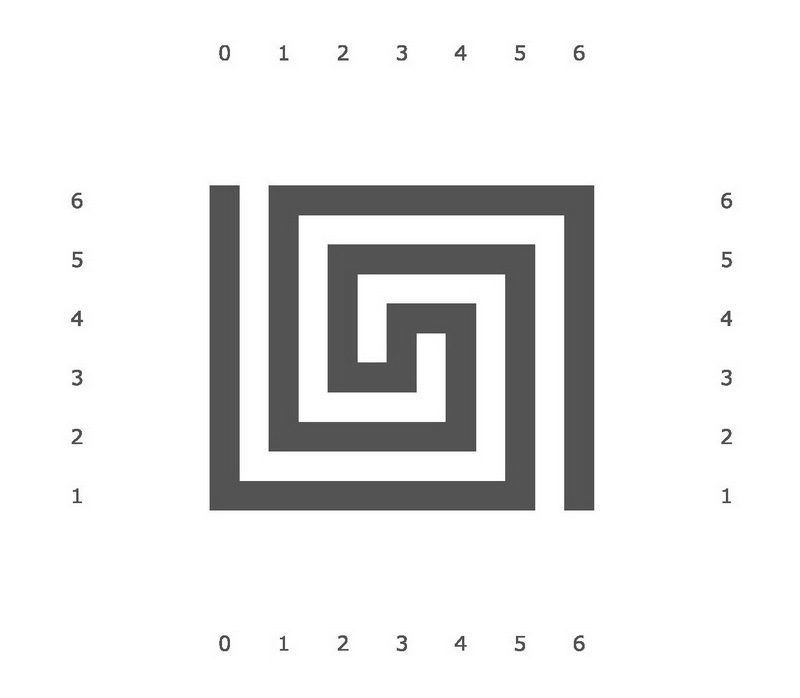 The connecting element between meander and labyrinth is the line and, respectively the path sequence (Tony Phillips calls it level sequence). 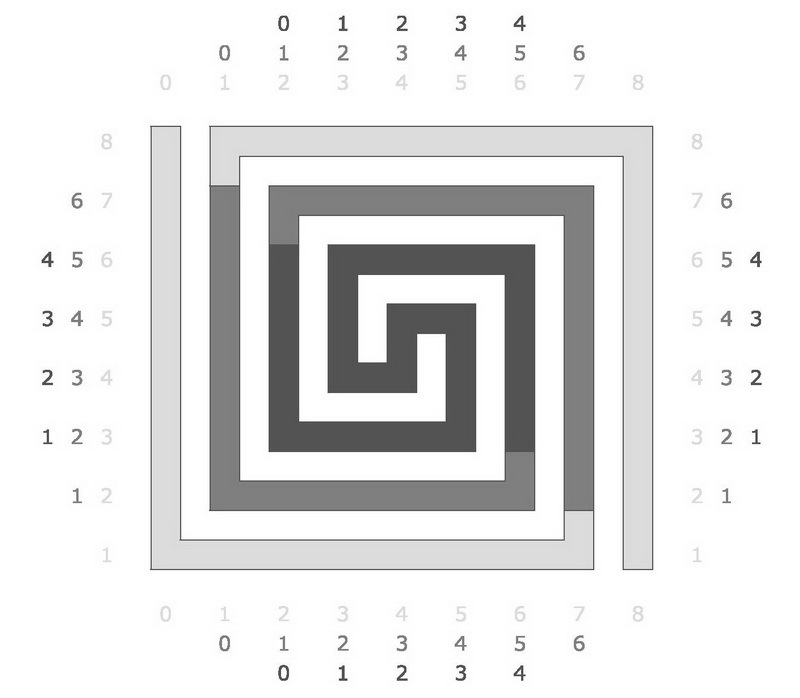 Through this path sequence the alignment of a labyrinth and its type is fixed. The number of the circuits is not sufficient. It depends on the movement form and this is expressed in the order, in that the circuits are passed. The basic type of a meander is build from four lines. 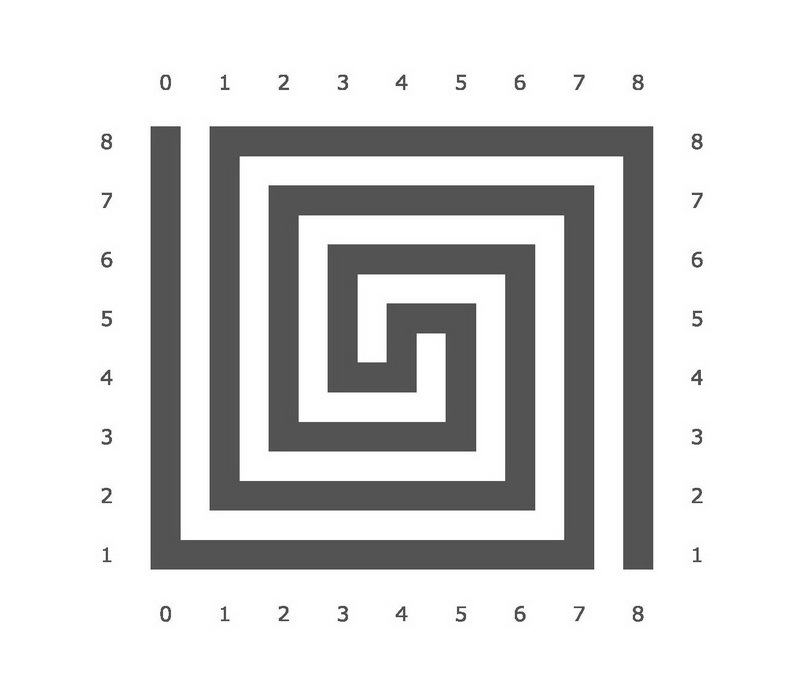 In a meander row the pattern recurs, but in the horizontal lines the element is included. As the first vertical line and the last one are identical, I enumerate the first vertical line with “0”. That stands for outside, and the last line (here 4) for the center. 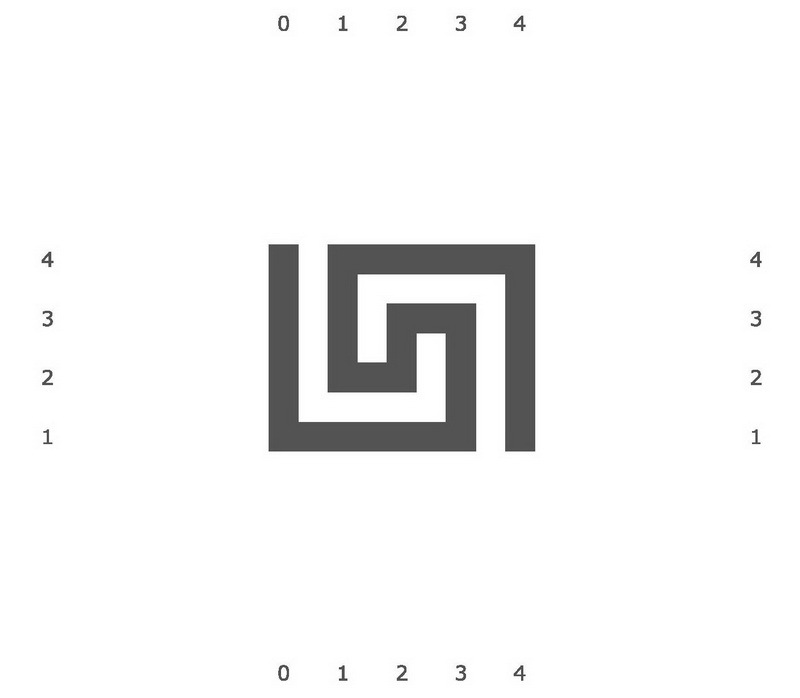 I read the line and path sequence out of the numbers of the vertical lines (written horizontally in the drawing). 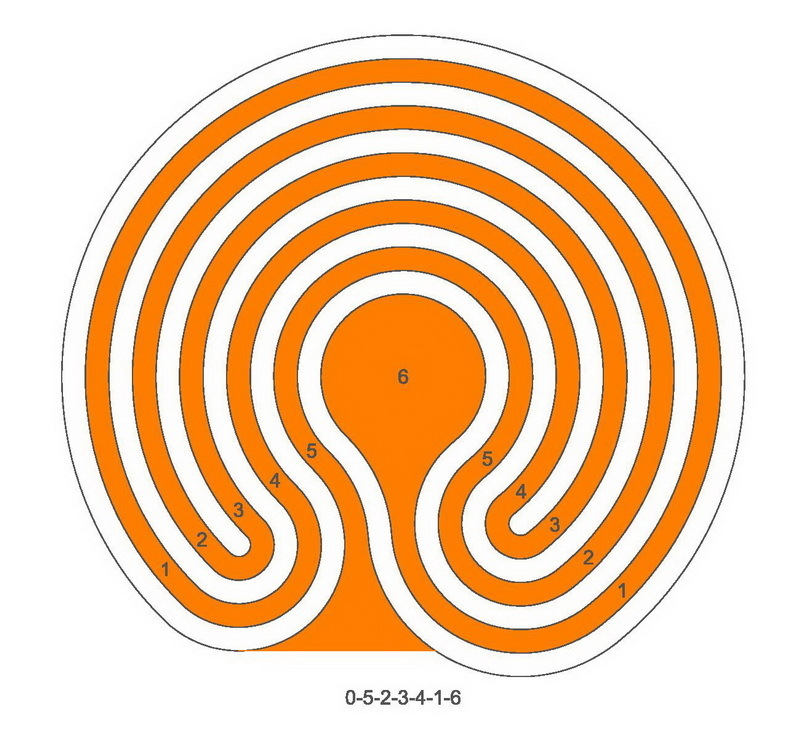 This is the order in which the lines will run through the meander (and in the labyrinth). So I will get: 0-3-2-1-4. With this set of numbers I transform the angular, straight-line meander into a labyrinth with its entwined lines. This has three circuits with two turning points. I construct directly the path (Ariadne’s thread) of the labyrinth based on the path sequence without using a basic pattern for the boundary lines (walls). They arise by itself as the limitation of the way. If I extend now the free ends of the two lines of the meander in all directions, adding so two more lines, I arrive at the next step and will have the type 6. The line and path sequence deduced from it is: 0-5-2-3-4-1-6. Based on it I can generate a 5 circuit labyrinth with two turning points. The line and path sequence results in: 0-7-2-5-4-3-6-1-8. In the following drawing all 3 types are shown together. Thereby the “right turning moment” of the meander is indicated better. By enlargement one could continue the row of the types, however, this would not be interesting any more. 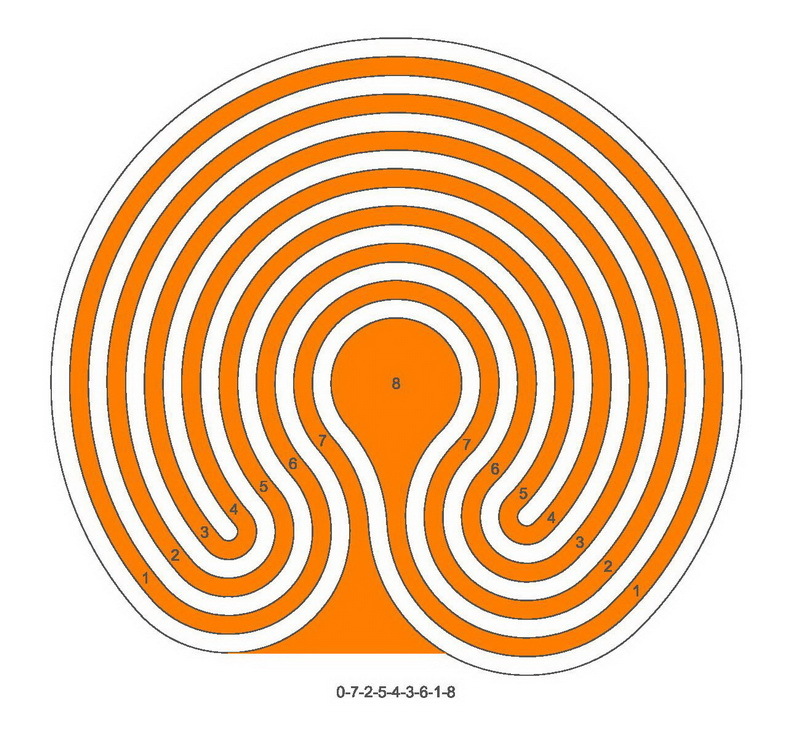 In the labyrinths generated from the meander is striking that the first walked circuit immediately circles the center and then is commuting outwardly. Then the entering of the middle happens directly from completely outside. We thereby receive quite an other “feeling” than by walking the more known classical labyrinth which is generated from the basic pattern. In the following posts the 3 different labyrinth types were treated once before and the construction explained explicitly. 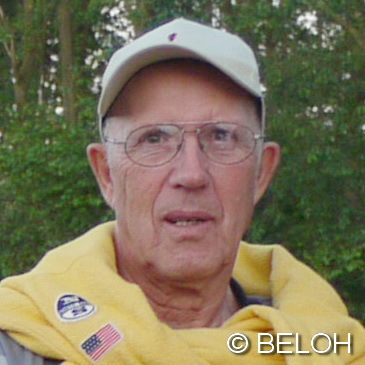 very interesting and inspiring post (as your previous posts on this subject). Considering the geometric figures we find a broad variety of figures that are referred to as meanders. If we look at what figures occur in labyrinths we basically find what you described as the labyrinth meander. I refer to this type of meander only when I further describe it as single, two-fold, three-fold etc.. meander. My single meander is identic with your type 4 that occurs in the Knossos-type labyrinth, my two-fold meander corresponds with your type 6 that is the core labyrinth of Rockcliffe Marsh. 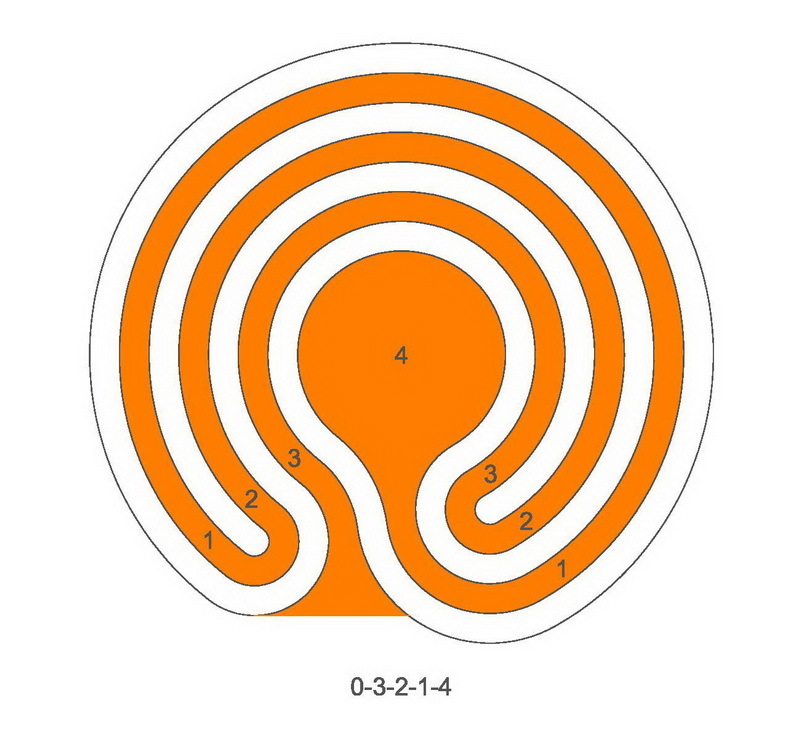 Furthermore a five-fold labyrinth meander (your type 12) is repeated four times in the sector labyrinth of Algier.